BulletVPN, a new VPN from Estonia, is promising secure connections with unlimited bandwidth and speeds as fast as a bullet. They let their users enjoy their secure connections by providing five different protocols users can choose from: PPTP, L2TP, OpenVPN, IKEv1, and IKEv2. Pro Tip: We recommend L2TP as the default protocol to start with as it comes built-in with every Windows and macOS; if possible OpenVPN based on your device and operating system. Users with different devices can enjoy the services of BulletVPN because one account can be used in three devices simultaneously. 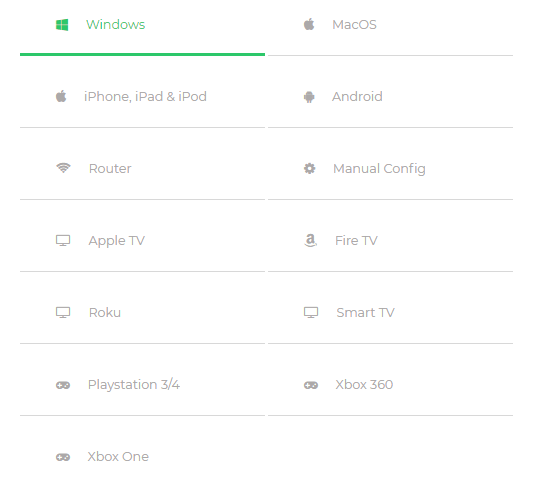 It’s available in a wide range of devices, from Windows, Mac, Android, and even Smart TVs and gaming consoles such as Xbox and Playstation. The VPN also has a no-log policy, which is a huge plus to users who are looking to be anonymous on the web. Besides giving users secure connections, it also provides Smart DNS, which can access geo-restricted content in all your devices, be it on your desktop or your Smart TV. Subscribing to the VPN can be done via PayPal, credit cards or Bitcoin. It costs almost $11 a month and nearly $4 a month for a 1-year subscription. If you ask us, their 1-year plan is pretty affordable. Still not sure of BulletVPN? They provide a 30-day money back guarantee, no questions asked or you can continue reading to see if it’s really worth it. Server and Locations: We like variety. They have it. BulletVPN provides their users plenty of servers to choose from. They provide 30 locations such as United States, New Zealand, Hong Kong, India and many more. BulletVPN has a decent amount of servers available around the world. This is good news for users who are looking to access geo-restricted content. Whether it be series, movies or academic materials, BulletVPN provides many options to choose from when it comes to accessing content. They do not just provide one server for one country. Countries such as Germany, United States, and Canada and many more have more than one server. Netflix Test: That’s a yes! The abundance of servers of BulletVPN doesn’t go to waste when it comes to accessing Netflix. Netflix is available when using BulletVPN, which is a relief as a lot of VPN providers cannot really provide access to Netflix, which leads to empty promises and ruined expectations. Because BulletVPN is quite new, it’s plausible Netflix hasn’t detected the IPs of the servers. We remain skeptical of long-term performance for this reason. Torrenting Policy: Torrent support. That’s a tick. Getting a VPN for torrenting is really common but it’s also common to encounter VPN services that do not support torrenting and even prohibit users from doing so. Whereas BulletVPN supports torrenting and provide P2P services for fast and secure connections for torrents. Kill Switch: We like switches. You should too. If it weren’t for their slow speeds, BulletVPN could be the perfect VPN for torrenting. They provide secure P2P connections, support torrenting, and a kill switch. Having a kill switch is really handy not just for users who torrent but also to those who want to remain anonymous on the web at all times. Navigating BulletVPN is really easy and stress-free because of their simple interface. After signing in to your account in using the VPN client, you will see everything you need to start using their services. There is a big Connect button in the middle of their client, which can automatically connect you to the best connection available. Choosing a specific server can also be done easily by clicking the button below the Connect button and searching for your preferred server by scrolling down their list or simply typing the server name. The Windows app interface for BulletVPN. Additional buttons lets users access their settings, account, and location. IP and DNS Leak Test: Let’s do this. We tested three servers: The United States, Hong Kong, and Germany. Any effective VPN should be able to hide your IP and DNS, which is exactly what we tested to see BulletVPN’s effectivity. The VPN successfully hid our IP address but we found it a bit weird that our IP address led to California when we connected to their New York server. At the end of the day though, what’s important is our original IP address was hidden. BulletVPN also passed the DNS test smoothly. Encryption and Protocols: The more the better. To provide secure connection and anonymity to users, VPN services must have top-notch encryption and protocols. BulletVPN has 256-bit AES encryption, which is considered to be military-grade. For their protocol, they provide five different options, PPTP, L2TP, OpenVPN, IKEv1, and IKEv2. Each protocol has their pros and cons but many consider OpenVPN as the most secure. Providing their users with the following protocols is commendable for a VPN service, much more a relatively new one. Pricing & Plans: A bit of the pricey side. BulletVPN offers three plans for their users to choose from. Their first plan is a one-month plan that costs $10.98. Their next plan is the six-month plan that costs $9.16 a month, which will have a total cost of $54.98. Their best plan available is their one year + one year free plan that costs $3.75 a month which will amount to $89.98. To be honest, their monthly plan is a bit costly but if you’re ready to invest your time and trust with BulletVPN, it’s best to take the yearly subscription plan. To be honest, their monthly plan is a bit costly compared to our top choices like NordVPN. Payment Methods: Why only three? BulletVPN has the basic options when it comes to payment, PayPal, credit card and bitcoin. The three options already serve a wide variety of people, which is good considering they’re pretty new to the game. Bitcoin is a welcome choice to the VPN scene. Obviously having Bitcoin payment is a great plus! Device Compatibility: They covered pretty much all of them. As we’ve mentioned before, BulletVPN is available for Windows, Mac, Android, Smart TV, PlayStation, and Xbox users. They accommodate a variety of users, which is great but we would like to see BulletVPN extend their services to Linux users via an app instead of requiring Manual Config. Pretty much standard set of compatible platforms. Logging Policy: No logs is a good thing. The only information they keep is access attempts to their services and they store it for good reason, for security and troubleshooting. They do not collect sites visited, DNS lookups, emails etc. Other VPN services should learn from BulletVPN because they do not store any private user information within their systems. Sign Up Process: Keep it simple stu.. you guessed it. As a VPN that promises no logging, BulletVPN requires little information for an account to be made. All you need to give them is your email, password and billing information when you subscribe to their services. They won’t ask for your name, contact details and other information that you might not want to give. It is optional to add your name, billing address and other information once you have created your account. VPN Speed and Performance: Missing the action. Speed as fast as a bullet is what BulletVPN promises. Unfortunately, it doesn’t live up to its marketing pitch. We tested three servers: The United States, Hong Kong, and Germany. Both Hong Kong and Germany servers performed terribly while their United States server was a bit bearable. They did say that their speeds varied from server to server. We’d like to see faster and more consistent speeds from BulletVPN. It would be a waste of good VPN features if they can’t improve on their speed. Refund policy: No free trial though. First time VPN users and even long-time VPN users are always looking for free trials before purchasing any VPN, whether it has received good or bad reviews. Thankfully, BulletVPN has a 30-day money back guarantee, no questions asked. It won’t feel as secure as a free trial, but if they guarantee to give your money back, then they’re liable to give you your money back. Customer Support: Live chat would have been nice. 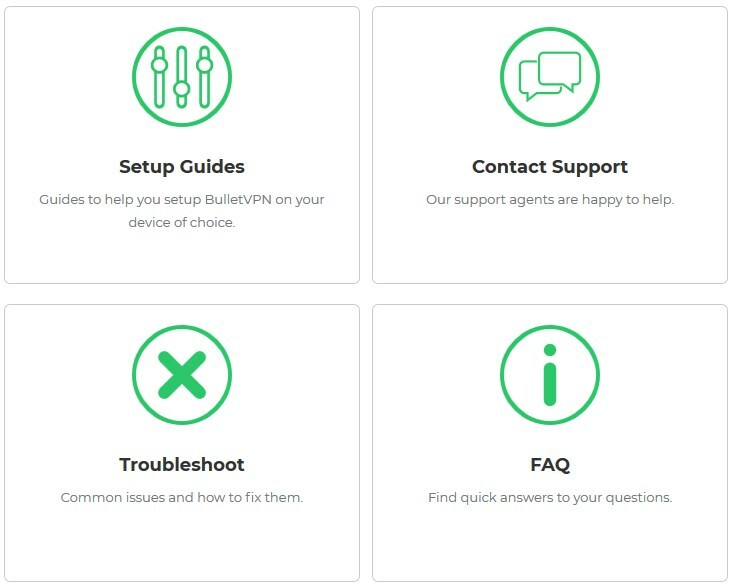 BulletVPN provides a useful help center, which contains setup guides, FAQ, and troubleshooting guides. Contacting support by opening tickets can also be done through the help center. We’ve encountered a slight issue regarding our password and we’re satisfied that their support team replied within a few hours with a solution. BulletVPN doesn’t offer live chat but their support team does a great job with getting back to their customers. The company that created BulletVPN is Nixworks OÜ, a company from Estonia. The country of origin of their company was the only piece of information we could find on the Internet. We don’t really know much about them, but what made an impression on us is how they value one’s right to remain anonymous. Estonia is a country in Northern Europe. Though they are based in Europe and in the EU, they aren’t a part of the 14 Eyes Alliance, which is good news for BulletVPN users. Besides worrying if a VPN service is under the alliance, information selling is also a problem of VPN users. Again, BulletVPN has a no log policy and on top of that, they do not give or sell information to third parties. As a new player in the game, BulletVPN isn’t bad. They provide secure connections by providing various protocols, a kill switch, access to Netflix, and support torrenting while keeping a no-log policy. Those are a few things that even long-time VPNs fail to provide their users. The only catch to BulletVPN is their slow speed. We’ve experienced their unsatisfactory speeds on some of their servers but there may be some servers that perform better. Their slow speed can let users stream freely but we wouldn’t say it’s the speed of a bullet. $3.75 a month for 12 months is a competitive offer. Having one account to connect three devices simultaneously is possible (although we would prefer more), unlimited bandwidth, means unlimited streaming and downloads is also possible with BulletVPN. However, the company is still relatively unknown and Netflix is a gamble. For a guaranteed positive experience, we recommend using one from our top 10.